The film opened in the year 2287 on the desolate planet of Nimbus III ("the Planet of Galactic Peace") in the Neutral Zone, where a renegade Vulcan named Sybok (Laurence Luckinbill) was introduced on his "quest for ultimate knowledge"; he exhibited a unique telepathic, mind-controlling power to help every person with "secret pain" ("Share your pain"), in order to expose and reckon with it, and force it into the light; he announced he was in need of a starship. While Cmdr. Pavel Chekov (Walter Koenig) assumed the captain's chair, Kirk and other crew took the shuttlecraft Galileo to the Nimbus III surface, ambushed a look-out party of scruffy colonists, and entered Paradise City, where they were confronted by Sybok - who announced: "I must have your starship"; he forced the Enterprise crew to take him on the shuttlecraft back up to the starship (during Captain Klaa's Klingon attack) for a manually-operated emergency landing in the docking bay; then the starship sped off at warp speed to avoid destruction; afterwards, a struggle for control of the ship broke out, and Spock - who had a chance to kill Sybok - refused; it was revealed that Sybok was Spock's exiled Vulcan half-brother who had chosen emotion/passion over logic. 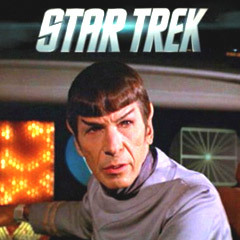 On a spiritual quest, Sybok demanded a "change of course" to the mythical planet of Sha Ka Ree ('heaven' in Vulcan, or the "Source", "Eden") beyond the Great Barrier energy field in the center of the universe - a "common dream of a place from which creation sprang"; to demonstrate his power of conquering internal emotional pain by releasing it, Sybok had Dr. McCoy relive the experience of his father's euthanized death, and Spock relived his outcast birth (as half-Vulcan, half-Human) - both were healed, but Kirk refused the brain-washing treatment: "I don't want my pain taken away. I need my pain." After breaking through the Great Barrier, the Enterprise came upon a small blue planet in the uncharted region; a Copernicus shuttlecraft landing party explored a large outcropping of rock on the barren plain, where a disembodied God-like Entity (George Murdock) appeared; strangely, the Entity asked about using the starship "to carry my power to every corner of creation," prompting Kirk to ask: "Excuse me. I'd just like to ask a question. What does God need with a starship? "; worried about Kirk's doubt and queries, McCoy said: "Jim, you don't ask the Almighty for his I.D. "; but when both Kirk and Spock were struck with bolts of lightning for asking the same question, McCoy challenged the malevolent Entity: "I doubt any God who inflicts pain for his own pleasure." Sybok also began to doubt his own journey and the imprisoned Entity, who appeared to only seek escape from the Great Barrier; the Entity mocked Sybok's ego, changing its form to resemble him, and taunted: "What's the matter? Don't you like this face? I have so many, but this one suits you best! "; then Sybok confessed his own arrogance to Spock, and sacrificed himself by merging the Entity's power with himself as a photon torpedo from the Enterprise exploded in their midst; McCoy and Spock were teleported onto the starship Enterprise, as Klingon Captain Klaa attacked the ship and also destroyed the Entity. Kirk was beamed aboard the Bird of Prey, where Klingon General Korrd had convinced junior officer Captain Klaa to personally apologize to Kirk for his unauthorized Klingon attack; an unusual reception was held onboard the Klingon ship for the crews of both vessels, and the film ended with another campfire scene back at Yosemite National Park. The fifth film of the original series, and the series' fourth sequel. Shatner's directorial debut film. Nominated for six Razzie Awards (with three wins): Worst Actor (Shatner), Worst Director, Worst Picture. With a production budget of $28 million, and box-office gross receipts of $52 million (domestic) and $70 million (worldwide). Great Scene (s): the two instances of Captain Kirk and Dr. McCoy teaching Spock how to sing the campfire sing-along song: "Row Row Row Your Boat", Dr. McCoy's cautioning Captain Kirk about questioning the God-Entity: "Jim! You don't ask the Almighty for his I.D.!"